In autumn 1977, Ms. Agnes Roux disappeared. On August 13th 1983, Mr. Maurice Agnelet was suspected of her “murder” by an investigative judge, following the criminal complain of the mother of Ms. Agnes Roux. On April 23th 1986, the investigation chamber of the appeal court of Aix en Provence, confirmed the decision of the investigative judge to close the investigation without charging any suspect. 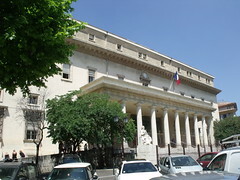 On February 1st 1988, the supreme court (Cour de cassation) rejected the appeal of the mother of Ms. Agnes Roux (case 86-92512). On December 20th 2000, Mr. Maurice Agnelet was again suspected of her “murder” by another investigative judge. On October 26th 2005, he was charged with “murder” by the investigation chamber. On December 20th 2006, he was acquitted by the criminal court of Nice. But the prosecutor appealed the acquittal (art.380-2 of the code of penal procedure). On October 11th 2007, he was found guilty of “murder” by the criminal court of Aix en Provence and sentenced to 20 years in prison. On October 15th 2008, the supreme court rejected his appeal (case 07-87723). On December 11th 2008, Mr. Maurice Agnelet filed an application to the ECHR (see below) on the ground that the 20 years investigation and the prosecution after the expiry of the statute of limitation were both in violation of articles 6-1, 6-2 and 13 that the formal charge of October 26th 2005 didn’t contain in detail the nature and cause of the accusation of “murder” (where?, when?, how?) in violation of article 6-3-a) and the 2 questions of the head judge to the jury on a new charge of “complicity to commit murder” on the last day of the trial was another violation of article 6-3-a). He added that the ruling of the 3 judges of the criminal court on October 9th 2007 which stated that he “lied“, was a violation of article 6-1, that the head judge refused to record the closing argument of the prosecutor on October 9th 2007 in violation of article 6-1, that the head judge had printed a decision where the jury found him guilty before its deliberation in violation of article 6-1 and that the criminal court judgment was groundless in regards to his guilt and to the length of his sentence in violation of article 6-1. On December 13th 2010 and August 17th 2011, the applicant submitted two additional briefs (brief 1, brief 2). The applicant is represented by Me Francois Saint-Pierre (Lyon/Paris). On September 27th 2011, the 5th section of the Court ruled that the application was only admissible for the lack of ground of the criminal judgment, and communicated the application to the agent of French Republic with questions to be answered within 16 weeks. Surprisingly, the 5th section found that the formal charge of October 26th 2005 was not in violation of article 6-3-a) on the ground that it was a “93 pages brief” that detailed the “attitude of the defendant with the family” of Ms. Agnes Roux.